Laramie Animal Welfare Society presents : Cats on Mats, the purr-fect workout for your body and soul. It's time to break out your yoga mats and pet some cats and kittens! 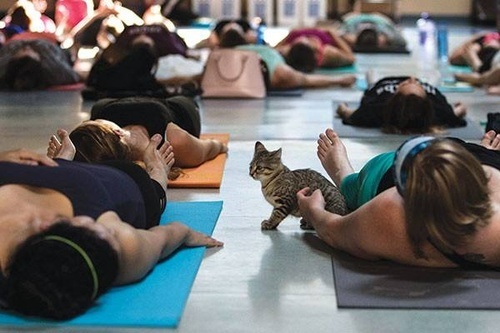 Unwind, stretch out and enjoy a one-hour guided yoga class while adoptable cats and kittens wander the room. Details: Cats on Mats is an all-levels class. This class may not be suitable for children under 8. All you need to bring is a mat (or towel) and yourself. We have a few mats you can borrow, too. Space is limited so be sure to RSVP! RSVP by contacting LAWS on Facebook, here! Comment in the discussion or send them a message. Cost is $20/individual or $35/individual + guest. Payment may be made to LAWS directly through PayPal or at the door. If paying via PayPal, please bring your donation confirmation email.